Schendt Engineering Corp. was the prime consultant for this project and has Architectural, Structural, and Electrical sub-consultants working with them to provided full design services. 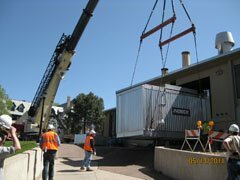 The project consisted of the replacement of a 40 MMBtuH High Temperature Hot Water (HTHW) Generator (G-1) with a 34 MMBtuH HTHW Generator. 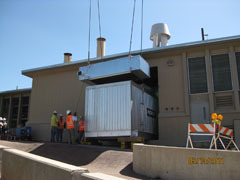 Pre-purchase documents were prepared and the generator was pre-purchased by the college. The work included installation of the new Generator (G-1) with a flue gas economizer, an atomization air blower, and a flue gas economizer pump. The flue gas economizer increased the generator efficiency from 80% to 85% by cooling the stack gases to 300°F. The generator was specified with new fuel trains, combustion control system, and burner management system. 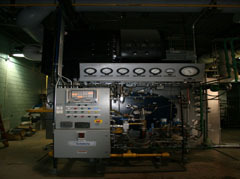 The flue gas economizer was piped in a side-car arrangement with the campus HTHW return piping to maximize efficiency. A variable speed economizer pump was installed to provide flow thru the generator. This work required numerous piping modifications for the new generator, pumps, atomization air compressor, flow meters, and valves. A new atomization air blower was installed to provide atomization air to the burner when burning No. 2 fuel oil. The pipe stress analysis was updated on the HTHW piping system to verify the manufacturers and the ASME code requirements. The combustion control system for the new generator is a microprocessor based multi-loop type to match the existing controls. The burner management system is microprocessor based system using an Allen Bradley Compac Logix controller and non-proprietary devices. Gas flow meters were installed on each of the central plant generators and connected to the plant master controller to calculate the efficiency of each unit. The construction cost for this project was $1,300,000.00.